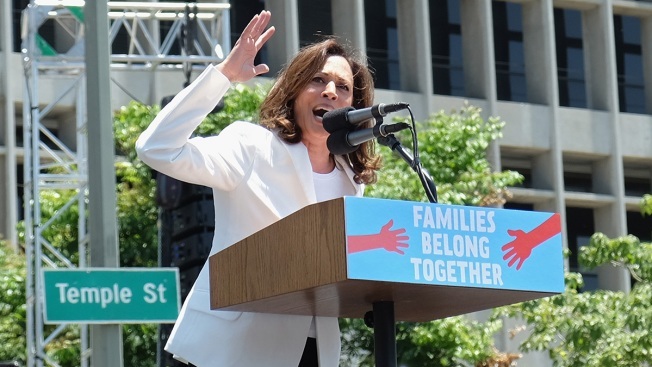 Senator Kamala Harris speaks at the Families Belong Together - Freedom For Immigrants March at Los Angeles City Hall on June 30, 2018 in Los Angeles, California. The White House on Monday accused two Democratic senators of not knowing the role of U.S. Immigration and Customs Enforcement. The exchanges come as Democratic incumbents and activists have called for ICE to be abolished in the midst of President Donald Trump’s immigration plan, which initially had parents and children separated at the U.S. border. An executive order ended the separation.